The Canadian Tire on Bell Boulevard has been decorated for Christmas since before Halloween this year. Most residents asked agree this is too early to be decorating for the holidays. Photo courtesy of Tara Henley, QNet News. BELLEVILLE – Christmas fever has arrived early in Belleville this year. Holiday decorations have been popping up across town this past week. 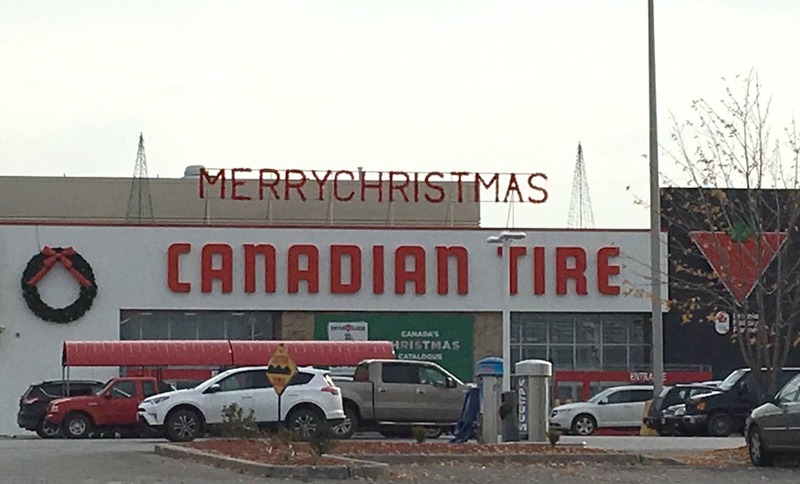 The Canadian Tire on Bell Boulevard has sported a Santa’s sleigh and “Merry Christmas” sign since before Halloween. Restaurant chains like Starbucks have also begun featuring traditional holiday meals and beverages on their menus. Other local retailers such as Shoppers Drug Mart have stated online that they will be holding off on decorating or advertising for Christmas until after Remembrance Day on Nov. 11 out of respect for veterans. Loyalist College student Catelyn Roberts said she agrees with waiting to decorate. Andy Anderson, the president of the Belleville Royal Canadian Legion branch, said he believes it isn’t out of disregard for veterans that retailers have been decorating for Christmas. “I’m not sure these people are trying to be disrespectful. I think it’s just that time has passed and people forget. People need to remember that it’s because of veterans that we live the lives we do today. Belleville residents Rebecca Huntington and Kaitlin Struthers say it shouldn’t matter if people decide to decorate for the holidays before Remembrance Day. “Whatever makes you happy and whatever you celebrate, you should decorate for it,” said Huntington.